Often, a Herman Dune gig is a rambling event, loosely held together by the magnetic force of front man David Ivar Herman Dune’s slightly oddball personality. Tonight, he’s more subdued, more professional. He’s smartened up his act, wearing a tucked in shirt, tie, trousers and hat rather than the baggy, mismatched, primary colour clothes of old. The rest of the band have caught on to the new look; it’s almost as if there is a band uniform of hats and moustaches. It's common to leave a Herman Dune gig feeling as if you’ve spent some time inside David Ivar’s sweetly upside down head, participated in his skewed romances and shared in his cartoonish take on life, but this evening's set is more focused, not at the mercy of wherever David Ivar’s easily distracted mind takes it. The only anecdote he has to share with us this time is an outing to Johnny Roadhouse’s musical instruments emporium down the road to buy a ukulele, which is later stroked expressively. Herman Dune's fragile folk, built round David Ivar’s high, wiry, slightly vulnerable voice, is beefed up by the John Natchez Bourbon Horn Players, who add loud solos to Herman Dune’s quirky songs. Next Year in Zion, title track of the new album, is a jaunty party tune, horns toot tooting. On a Saturday is one of the loveliest they’ve ever made, rasping horns borrowing heavily from Elvis’ Always on My Mind and backing singers the Baby Skins swooning in the background like fallen angels. They still retain a sense of melancholy and rootlessness though, wood blocks clip clopping like horses hooves over Herman Dune’s characteristic trotting rhythm on the yearning My Home is Nowhere Without You. Drummer Neman, in a cap and waistcoat, looks like a weary traveller pulling out a saw at the side of the road for the evening's entertainment, hitting it theatrically with a beater for an expressive, rising and falling solo. Ballad My Baby is Afraid of Sharks and a breakneck rendition of 1, 2, 3, 4 Apple Tree, horns substituted for wispy flutes, show they’re still searching for the perfect love affair. There has been a growing interest in the home made over the past few years, even before the current credit crunch forced people to seek less costly goods and new forms of entertainment. Knitting in particular has enjoyed a revival and, far from being a solitary, spinsterish activity indulged in by lonely old ladies in rocking chairs, it's become more and more common to see groups sat knitting or crocheting in bars and clubs. ArtYarn, however, is separating knitting from its association with misshapen scarves and unwanted jumpers given by relatives who don't know what else to get you for Christmas and turning it into an “artistic medium”. If you were at the New Islington festival at the end of summer, you probably saw ArtYarn's brightly-coloured 'tree cosies', tree-shaped garments adorning the trunks of trees in Ancoats. The duo also works in street art, 'yarn bombing' various cities, from London and Berlin to New York, by tying small patches of knitting to street furniture as “graffiti knitting”. ArtYarn was invited to contribute to the Gaia project at this year's Liverpool Biennial, creating 'plastic bag bombs' out of yarn recycled from carrier bags found on the streets of Liverpool. 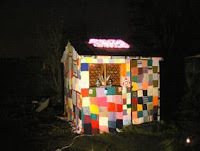 Now, it's embarking on its most ambitious activity yet, knitting a jumper to cover the Shed art gallery - a small gallery run by independent arts organisation Pool Arts - at the Tonbridge Road Allotments in Levenshulme. 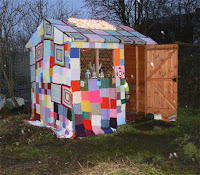 The project started with a joky remark that ArtYarn should make the shed a jumper to “keep it warm over the winter when it's closed”, but curator Alison Kershaw liked the idea. 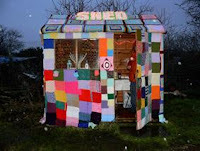 Each part of the shed was measured for panels of knitted patches created during public sewing workshops at St Lukes church, Longsight, and donated by the communities of Longsight and Levenshulme. Crocheted squares will tile the roof, pockets below the windows will hold flower boxes, and permanent knitted curtains will be installed. The knitters fund raise for Breast Cancer Care, and ArtYarn has further politicised a craft often seen as sedentary or old-fashioned by creating a blanket from 1,400 knitted squares, donated from all over the North-West, for the Manchester Oxfam Maternal Mortality campaign. Each patch represents one of the women across the world who dies in childbirth each day. The blanket was displayed at Beluga bar during the Labour Party Conference as a “knitted petition”. Rachael says it was effective in drawing attention to the cause as knitting is something “most people can relate to”, whether through knitting themselves or seeing one of their family knitting. The Kings Arms Knitting Club meets at the Kings Arms, 11 Bloom Street, Salford, M3 6AN, every Monday from 7-9pm. 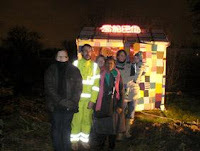 The Shed jumper project will be launched on Thursday 18 December from 3-7pm with mulled wine, mince pies and knitting demonstrations at Tonbridge Road Allotments, Levenshulme, M19. There is a frequent 192 bus service from Piccadilly to Levenshulme. Get off at The Wheatsheaf on Stockport Road, turn left into Broom Lane, then take the first right into Tonbridge Road. It’s common knowledge that there’s a secret world underneath the city, a network of tunnels and underground rivers. Not many of us actually get to see it, though, so it’s a continual subject of debate and suggestion. Now, digital photographer Andrew Paul Brooks has turned what goes on below the surface into works of art. His camera acts as our eyes behind closed doors and in forgotten chambers, exposing the mechanics behind familiar facades. 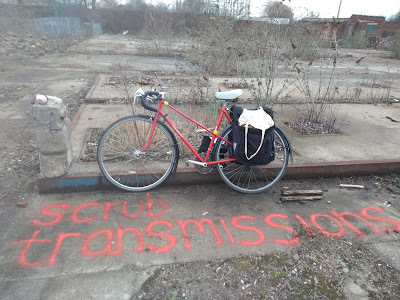 The pictures really draw us in, give us a sense of what’s actually like to be there, in the bits of the city that we’re closed off from, sites rotting away whilst everyday life goes on unconcerned. We get into a pattern of walking the same old streets, past the same buildings and sights, forgetting about the possibility of anything existing on the periphery, outside our immediate range of vision. Brooks captures those “snatched glances into an open grate, through a broken hoarding, behind a door ajar”, that are often no more than that - tantalising at the time, but soon forgotten - with the help of Urban Explorers, a secretive, anonymous community that explores the hidden side of our cities. They put themselves as risk of death, arrest and unseen hazards such as asbestos, but Brooks’ photographs make it easy to see how their clandestine exploration could be addictive. The space is perfect for the exhibition – the top floor of Urbis, overlooking a skewed window that's built into the sloping white ceiling. You can see the clock tower, grubby brickwork and ornate red metalwork of Victoria Station, with new, high-rise construction going up behind it in glass and steel. Standing on the mezzanine level, we can see all the way down to the bottom, our line of vision bouncing off the angles of the building. ‘Great Abel’ invites us inside the town hall clock tower. Light streams into the tower and our gaze ascends to a dizzying height, past worn wooden beams and warm bricks. Brooks’ photos are more snatches of overlooked memory than complete pictures, black around the edges like an overexposed negative. ‘Great Abel’ is a mere keyhole portrait swimming in a darkened background; stand back and it looks like a scrunched up can someone's crunched in the middle in preparation for throwing out to be recycled. We look out over the toy-town of Oxford Street from behind the illuminated letters and silhouetted brickwork of the Palace Hotel, hung with glowing red cobwebs, in ‘Quiet Refuge’. We’re elevated to the same level as the stars in an opulent, over-cast sky purple with light pollution. The sight of a Magic Bus, reduced to the size of a collectible car, is almost comical in its triviality. In 'Keeping Time', we’re in the internal decay of the Palace’s clock tower, peeling and mossy. Our view descends the spiral staircase, looking down as if into a well. In another print, the dome of the Palace occupies a round area in the centre. Red-orange, yellow and lime lights fly off the dome haphazardly onto the walls around it, like being inside a Christmas bauble. 'Central Foundations' goes beneath the Great Northern Warehouse into the disused Manchester and Salford Canal Tunnel. Although it’s deserted, the picture makes us feel claustrophobic and crammed in, as it must have been during the war when the tunnels were used to shelter from the Luftwaffe. Similarly, 'Cathedral Steps' shows a tiled public toilets, eerily signposted 'Convenience Closed for Repair' on a shattered pane of glass. We can imagine what it felt like to walk down the crumbling staircases. 'Culvert Report' too descends into the underworld. A ghost figure is barely perceptible against the slimy walls, dripping with moisture. The river looks tepid and unhealthy. We’re reminded that what goes on beyond our vision is just as important as what goes on in front of us. Things often seen as dry and unimportant are given colour: ‘Hidden Arndale’ is an underground road of red, yellow, blue and white pipes. Brooks’ camera imbues the everyday or utilitarian with a new patina of magic. An overflow tunnel of the Ashton Canal shines in an ethereal light. It’s luminous in wintry colours: blue, red, green and white like an idyllic fairytale grotto. The picture centres on a fuzzy halo of brilliant light, and we’re drawn in, to the proverbial light at the end of the tunnel. Whereas Brooks’ other pictures focus in on tiny, undervalued snippets of our city, 'Angelic View' reminds us of its magnificence. Perched on a corner of the Town Hall, an angel looks our over the Manchester stretching into the distance like the heavenly creatures that safeguard Berlin’s citizens in Wim Wenders’ wistful film Wings of Desire. The detail of the green, yellow, and brown grandeur of the brickwork, and the patchworks of light that is the Beetham Tower contrasts with the vastness of a sweeping, blurry sky. 'Big Humpty', which is abstract like a painting, with bursts of fiery red and a spurting green river, shows a tiny person in a tunnel of the River Medlock, and reminds us just how small and insignificant we are in relation to the great city. Perhaps the biggest appeal of these pictures is that they portray places that are undisturbed and underexplored. Looking at them acknowledges our childlike fantasies of escaping the crammed city for somewhere where we are free from scrutiny and can truly be ourselves, and explore unconstrained. Somewhere to get lost. History From Space is the new shop opened to showcase the work of artists and designers based at Islington Mill. Mark Carlin, a former musician, co-runs the Mill with fashion designer Bill Campbell, who bought the building in 2001. The Mill is also home to film makers and theatre, as well as the 'self-led' Arts Academy. Carlin says the shop is “a bit of an experiment, like everything else”. The shop isn’t in the Mill itself, because “there's not really space” with the art gallery and recording studio. Though also tucked away in Chapel Street, its location is“a little bit closer to town” than the Mill and just a short walk from Deansgate. What does it sell? Carlin sums it up as “a mixture of fine arts and digital arts prints, fashion and books”. The Glasgow based art books publisher Aye-Aye books has a space at the Mill and links to the art academy. The promoter Comfortable on a Tightrope is also selling fanzines and pamphlets. If you want something to hang on your wall, art ranges from large canvasses to small pastel life drawings and pencil nudes. Joe Barker has made whimsical acetates in blurry black and white, whilst David Williams photographs nature close-up in glowing colour. Andrew Brooks, who has an upcoming exhibition at the Urbis, is selling photographic prints of the Salford skyline. Tragen Design has contributed a shelf and a striking oval mirror with a wooden frame. Fashion fans will love Andrea Zap's garments made of vintage fabrics combined with new materials and unusual finds, as well as textiles by the wonderfully named company dontbitchstitch. T-shirts publicise the band Hotpants Romance, and there are CDs on sale by artists on local DJ Andy Woods' record label, Pronoia, which is based at the Mill. Ceramics are well represented. Liz Scrine has made fantastic, large scale pieces, including a sculpture of two towers, and a large, tree-like candle holder which is accompanied by ceramic rats and cheese and entitled ‘Stop the Rate Race’. She’s also selling leaf tiles and fold-up ceramic screens. Crackpots offers unique, Cubist influenced ‘thoughts bowls' and ‘goodie barrels’ stamped with provocative statements. Beverly Gee makes quirky ceramic pots festooned with twigs. There's an added, seasonal bonus - mince pies, as well as charming hand-made Christmas cards that are heavy on glitter. Future Carlin describes From Space as a “temporary store” - the building is owned by neighbouring Britch architects, who have given permission for it to be used for a year before it is redeveloped. He says it’s a “project-led” shop and there will be “things happening in it”. Artists’ groups, both local and from further afield, will be invited to get involved. Artists will be asked to respond to the space and see what they come up with. Verdict Far from being run of the mill. The great American politician, writer and inventor Benjamin Franklin famously said “In this world nothing is certain but death and taxes”, and they're something most of us would like to get out of. Peace Tax Seven, however, a group of conscientious objectors, is using tax as a political protest by withholding the proportion of their taxes they calculate goes towards war and military activities. To pay tax towards military activities, they believe, is akin to a modern form of conscription, and is “morally equivalent to fighting a war”. The group ranges from a toy designer and company director to a Welsh Buddhist, accountant, author and film maker. Birgit Völlm, a psychiatrist and researcher at the University of Manchester until earlier this year, explains: “War costs a lot of money, and my money was supporting that.” She finds it worrying “how easily countries can get involved in war”. It is thought that 10% of the government's expenditure goes on the military and a third, or £88 billion, of the government's fixed capital assets belong to the Ministry of Defence. Völlm points out “one hundred years ago people took slavery for granted and thought rights for women wouldn't change. People also had to go to war”. She remains optimistic, though, that “sometime in the future we will have the right not to pay for war”. The Peace Tax Seven website is full of emotive language – 'rights' are 'violated', paying tax equates to 'paying for the government's killing machine'. It claims that 90 per cent of the casualties of war are civilians. Roy Prockter argues “every bomb and bullet kills twice”, saying there are “indirect victims dying of want while the world's wealth is wasted on weapons”. As a doctor, paying taxes that go towards war is incompatible with Völlm's professional values: she cannot support something that “takes life away from people”, as the role of a doctor is to “help people and ease suffering”. Both Prockter and Völlm argue that the money would be better spent on fundamentals such as clean water and basic healthcare. The Peace Tax Seven has the support of Quakers, Buddhists and Anglicans. Völlm became involved through Manchester's Quaker Peace Corps, and helped set up an International Conscientious Objectors Day in Manchester, which happens in May every year. Manchester has a long radical history, and in 1980 became the world's first nuclear free city, creating the Peace Gardens and sculpture. Earlier this year, it hosted the 12th International Annual Conference on War Tax Resistance and Peace Tax Campaigns, which brought together campaigners from America, Spain, Germany, the Netherlands and Columbia. Withholding tax is part of a history of creative protest that goes back to the American author, naturalist and philosopher Henry David Thoreau. Thoreau was imprisoned in the 1840s for refusing to pay tax towards the state of Massachusetts, because it advocated slavery. More recently, in America it is estimated there were 20,000 war tax resisters against the Vietnam war by 1970. If the government didn't take any notice of the estimated two million protesters against the Iraq war, why would it listen to seven individuals withholding tax, rather than sending the bailiffs round? UK court cases brought by the Peace Tax Seven have failed, but the group is currently raising £50,000 to take their case to Strasbourg, and defend its right to “freedom of thought, conscience and religion” as set out in the Human Rights Act under the European Convention of Human Rights. The issue of the right to withhold war tax has been tabled as an Early Day Motion in the House of Commons, as well as a number of Private Members Bills, the last one being raised by John McDonnell in 2002. A number of MPs support the seven, including Jim Dobbin, Labour MP for Heywood and Middleton. Völlm is a member of the Green Party, which supports the protesters. Few of us would go as far as to withhold our taxes, or could afford to, and it's not really an option unless you're self-employed, as it's almost impossible to withhold tax through the PAYE system. However, the Peace Tax Seven opens debate on an issue it often seems we have little choice in, and puts moral pressure on the government. It also acts as a conscience for the rest of us. If you want to do something, but don't want to go as far as withholding your taxes, visit http://www.peacetaxseven.com/ and sign the petition, distribute leaflets or write to your MP. You can also join the organisation Conscience and fill in a 'Peace Tax Return' form which looks like a tax return form and can be sent to the Treasury to declare your objection to paying for war. Völlm says the group appreciates emails, which can be used to show the government how much public backing there is for the cause. She also encourages members of the public to attend the group's trials to show their support.